After inspecting the road, the Green Party leader said that the quality of work carried out by Chinese firm Jiangxi International was substandard and that he had no doubt their work at Kenneth Kaunda Aiport and Ndola Aiport will be equally as bad. “As the Green Party, we call upon the Chinese Government to write-off the loan which was given to the Zambian government for the Ndola-Kitwe Dual Carriageway because China Jiangxi International, is a Chinese Government company, has done a scandalous job. This is a serious diplomatic scandal. It is not right for the Chinese Government to engage in rip-offs like the Ndola-Kitwe Dual Carriageway,” Mr. Sinkamba said. 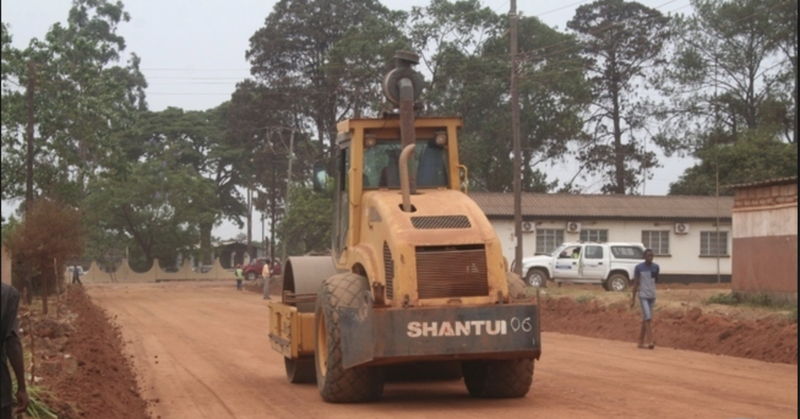 “The works to resurface less than 70km the Kitwe-Ndola Dual Carriageway has taken a record six years. We expect much better than that from a Chinese Government company. We cordially invite the Chinese Ambassador to Zambia to come to the Copperbelt prove our point. As a face-saver, the best the Chinese Government could do is just to write-off the loan,” Mr. Sinkamba said. He added that the road is now a serious hazard, especially in the night because half the total stretch of the dual carriageway has been ripped off.